Often in our field we need to survey long data sets, looking through images one at a time for interesting features. Autoplot's PNG Walk Tool facility will generate fixed images for intervals covering time range, or a "PNG Walk." For example, you have a useful product (vap file) that shows a day of data from a four year mission. You can then tell Autoplot to create daily plots for each day of the mission, producing roughly 4 * 365 images. Autoplot's PNG Walk Viewer is a tool which allows you to then look at this PNG walk, where you can flip through the images quickly. 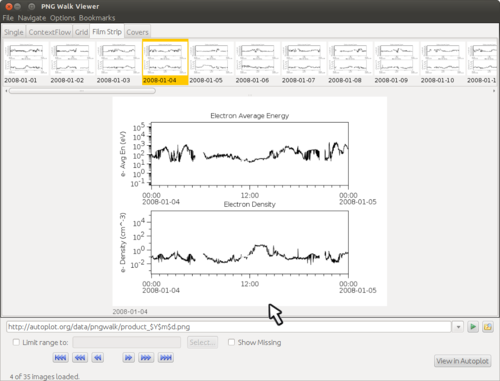 Several different layouts of the thumbnails are provided, and you can click on the "View in Autoplot" button to reload Autoplot with the configuration used to make the image. The PNG Walk Viewer is designed to work with any folder filled with images, from other groups' image walks, to test output and vacation pictures. The files need not be pngs either, .gif and .jpg files will work as well. To look at another group's walk, point the PNG Walk Viewer to either a templated file location like http://autoplot.org/data/pngwalk/product_$Y$m$d.png or simply a wildcard like http://autoplot.org/data/pngwalk/product_*.png. The PNG Walk Viewer will look for Autoplot features, like a folder called "thumbs400" where thumbnails can be loaded quickly. Output Folder is the location where the PNGWalk will be written. Note multiple PNGWalks can exist within the same folder. Overwrite will delete all the files found in the folder before creating the PNGWalk. Filename Root is a fragment to put in each file name. For example, "product_20150824.png" has the root "product". Version if specified, then a version string will be added. Rescale will rescale the time axis to provide context or overlap. For example, "-10%,110%" will add an additional 10% each end of the time axis. Autorange Each will autorange the plots as they are produced, resetting the other axes use best range. The "check autorange flag" box below this will only autorange axes that have the autorange property set to true. This allows some axes to be held constant while others are reset for each interval. Note too that an axis with the autorange property set may also use its "autorangeHints" property as well, which allows more precise control, such as "includeZero" or "widths=10,100,1000". Update Sequence will only generate images where the output file does not exist already. Generate intervals to cover time range is the default mode, where a span is specified. For example, if you want to look at daily images for the month of August in 2015, this would be "Aug 2015" and the time format would be "$Y$m$d", creating 31 files. Note Autoplot always allows times relative to the present, so you can say "P10D/now" to run the past 10 days. A Time Range Tool is provided to help specify this field. Note that for some missions, such as RBSP, Autoplot has identified orbit numbers which can be used to specify the span as well. Use events file that contains the list of times allows a file with a list of time ranges to specify the intervals. Note the default behaviour is to use the Time Format to create the filename for each file, so this should have sufficient specification, so for example, $Y$m$d_$H$M might be suitable when there are several spans within each day. Events file specifies the product names will instead use the third column of the events file to name each file. "Output Folder" is used to locate the files, and the thumbs folders will be created in this folder. Create Thumbs will create reduced versions of the images which can be transmitted quickly. Output Format allows PDF output to be produced instead of PNG. CreatePngWalk can be called from the command line for batch processing. For example, mission operations runs the pngs for their data products nightly, so the scientists they serve can easily check that data is coming in. --autorangeFlags     if true, then check each axis' autorange property, and only autorange if this is set to true. The PNGWalk tool provides an efficient browser for sets of images. Designed for a series of pre-rendered plots, including those not created by Autoplot and even vacation pictures. It takes a template for the filenames, deriving the time coverage of each file. For example, if pointed to http://autoplot.org/data/pngwalk/product_$Y$m$d.png, it will indicates the time covered by each png file. When a template cannot be made, a wildcard like * can be used as well (http://autoplot.org/data/pngwalk/product_*.png), and in this case the filenames are indicated. Note the pngwalk provides a number of views of the data: the single image with thumbnails of adjacent images above, a grid view with all thumbnails, and the "context flow" which shows the image in the context of the surrounding intervals. When Autoplot creates a PNG walk, it will also generate the thumbnails. The PNGWalk Tool looks for these in the subdirectories thumbs100 and thumbs400. 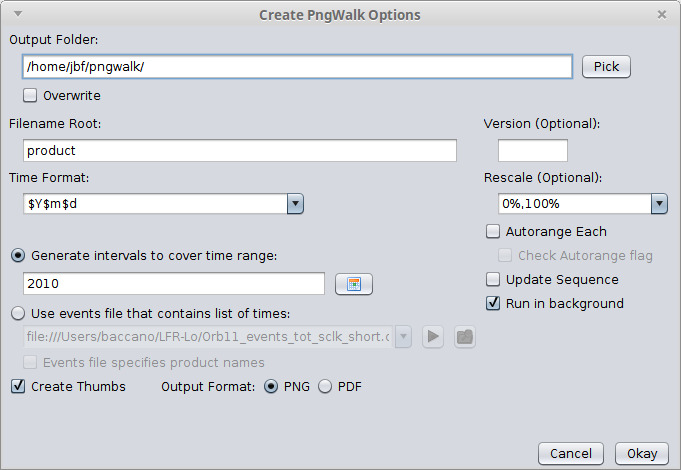 Also it creates a .pngwalk file, which can be used to refer to the entire pngwalk. For example, typing in this filename into the Autoplot address bar will launch the PNGWalk Tool with the correct template. Rich PNGs are pngs that have additional metadata, indicating axis information. When the image is clicked, the status message towards the bottom indicates the click location, in data coordinates. When the Rich PNG metadata is not available, the pixel coordinates are indicated. There's a digitizer that will collect these click positions so that new datasets can be derived from the pngwalk. Quality control (QC) is a facility that allows metadata to be added to the PNG Walk, such as red flags indicating that the interval needs attention. The "View in Autoplot" button will be enabled when a .vap file has been embedded within the PNG Walk. It will be combined with the image time to launch Autoplot with the configuration used to create the image. This page was last modified 17:19, 21 February 2019.